Curious preschoolers will love peeping under the flaps to see who will hatch from each egg in this lift-the-flap, animal counting book. There are eggs to count from 1-10, then lift the flap to find out whose eggs they are. A clue encourages children to guess who the babies will be: "I have a green scaly tail, who will hatch from my eggs?" says the mummy chameleon. Intriguing cut-through holes in the flap reveal further clues, with eyes or tails peeping through. 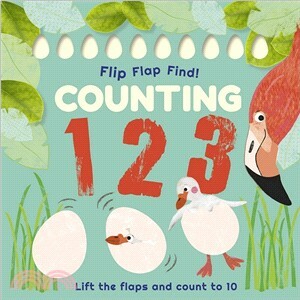 Whether insect, sea creature, reptile or bird, there's a whole wonderful world of animals and their eggs to discover and count in Flip, Flap, Find Counting 123 - from one fluffy flamingo all the way through to ten beautiful butterflies.